For some people a garbage disposal unit in full working order is something they would prefer not to be without. Instead of been an extra feature they would regard a garbage disposal unit as being an essential item to have in their kitchen. Garbage disposal units can take a lot of punishment, which can in turn make it more likely that they will break down at some point. Such units are best repaired by professional contractors as opposed to people trying to fix their own ones. Our company offers garbage disposal repair and replacement services. Residents of this district need not go without a working unit when they can hire us to fix or replace units. Garbage disposals can be broken if people are not careful about they put through them, as things like bones or metal objects can break the blades. The people that use units do find them really useful, which is why we are hired to fix broken ones. 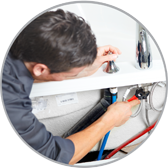 Our Garbage Disposal Repair in Chandler, AZ staff have plenty of experience in fixing units, and have the know how to carry out swift repairs. We have trained staff that will fix the problem and fully repair them. We only carry out the repairs that are required, and will replace units only if there is no possibility of fixing them. We will let clients know if spare parts are needed, and the cost of fitting those parts. We provide free quotes and all bills are fully itemized so our clients know exactly what has been paid for. Our Garbage Disposal Repair in Chandler, AZ are able to carry out jobs at any time of the day, so clients do not have to take time off work whilst we get the job done. Contact us now to get broken units fixed.